Treat your face to a truly luxurious experience at the end of the day with this luscious facial oil. It is formulated with the most high end skin oils you can buy and essential oils that are specifically used for aging skin and blemishes. You will find your skin to feel and look younger and healthier in just a few uses. Wrap your body in Kashmir with this luxurious, all natural, ultra creamy shaving bar soap. This pure coconut oil soap with added castor oil for a rich creamy lather will leave your skin feeling soft and clean. Bentonite clay is added to provide the slickness needed for a smooth shave so you won't be left with red, itchy bumps, no matter where you're shaving! 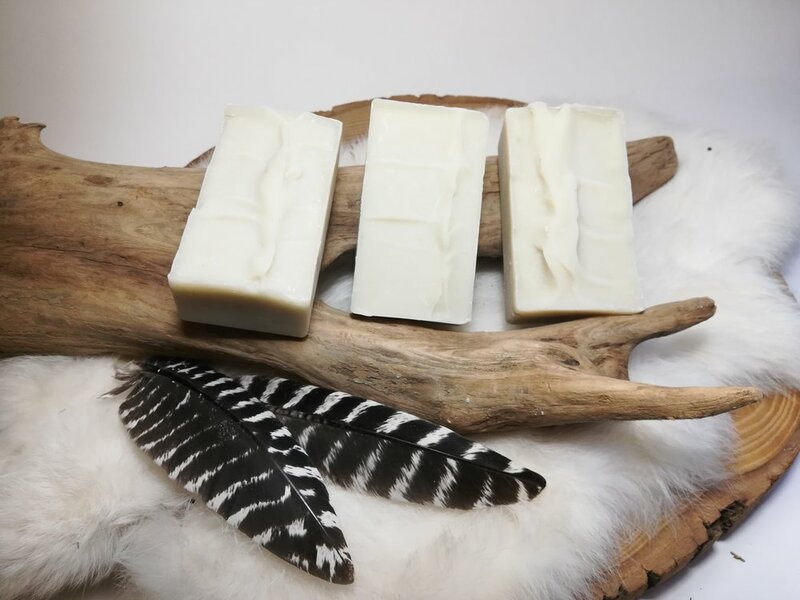 Designed with both men and women in mind, this soap is infused with the fresh and grounding scents of wild orange, copaiba balsam and cedarwood essential oils. Shatter your illusions of what a face wash should be and pick up a bar of Gold Dust Woman. Infused with activated charcoal this coconut oil soap boasts the cleansing and purifying properties of tea tree essential oil, balanced out with nourishing oils of sea buckthorn and jojoba. Halo is the ultimate in shampoo, providing volume without the frizz and conditioning without making your hair greasy; it provides total scalp to tip nourishment! This coconut oil soap is infused with horsetail, argan oil, and essential oils of rosemary, Virginia cedarwood, clary sage and lavender. It will leave your hair stronger, healthier and shinier in just one wash! Ingredients: Coconut oil*, distilled water, sodium hydroxide, argan oil*, rosehip seed oil*, horsetail powder*, lavandin powder*, rosemary EO*, Virginia cedarwood EO*, clary sage EO*, lavender EO*. Need to impart a little magic into your beard? Look no further! Let the power of Odin grace your face and gift you with the most epic beard of all your hipster manly friends. Using only the highest quality organic ingredients, this oil will bring a shine to your locks while also moisturizing your face. No more itchy redness under your beard! Pair with Wicked Garden Facial Cleanser for the ultimate in skincare. Treat your skin to a spa-like treatment with this specially handcrafted skin soothing soap. Formulated with problem and sensitive skin types in mind, this bar combines the healing plant powers of Aloe Vera, Oatmeal, Chickweed, Calendula, and Lavender with Apricot Kernel, KuKui Nut, and Borage oils. See a noticeable difference in the health of your skin with just one wash. Use on the whole body or as a hand soap! You can't go wrong! Wake up your skin with this gentle yet uplifting facial cleanser infused with eucalyptus leaf powder, french green clay and spearmint and eucalyptus essential oils. Give your skin a perky, fresh start to the day! Follow up your daily regiment with Idunns Secret Facial Oil. 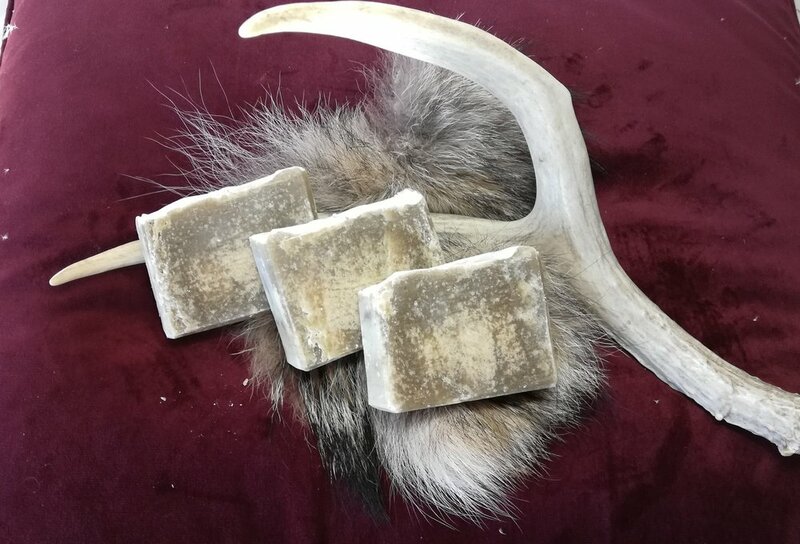 Delicately scented with Scotch Pine essential oil, this special Yule time soap will be sure to lift your spirits and put you in the holiday mood. Made with Jojoba oil and French Green Clay for their skin soothing properties to help keep your winter skin soft and moisturized. Ingredients: Coconut oil*, distilled water, sodium hydroxide, jojoba oil*, French green clay*, Scotch Pine EO*. Embody the goddess Sif by applying this light and luxurious hair oil, and let your hair be the envy of all. This blend is lovingly crafted from the highest quality organic oils of Apricot, Jojoba and Castor, and is sure to enliven even the most exhausted locks. A few drops will do! This beautiful blend goes especially well with Halo Shampoo Bar. This dream duo is sure to give you the radiant, healthy strands you've been longing for. A modern day alchemist and herbal artist, Pacific Northwest born and raised witch Laura Ursula Quinn spends her days dreaming up concoctions of herbal remedies and natural skin care products. The Rogue Witch is passionate about sharing her love of herbal medicine and helping others with her uniquely crafted herbal and witchery goods imparted with her very own magic. Enthralled with the magic of the woods, Ursula can often be found out collecting plants, dipping her toes in creeks, and scavenging for treasures.